Here is a new journal I've designed to put in my display at the Crafters' Gift Boutique. I love journaling at the end of my day. It lets me reflect back on my day and clears my mind. I find I rest better once the words have been committed to paper. 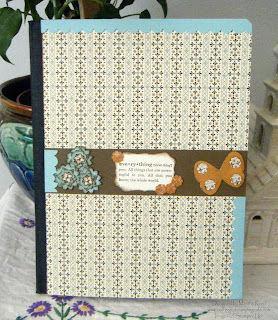 The Spice Cake Designer Series Paper and the Define Your Life Stamp Set are now retired but were perfect for this journal. I added some flowers and a butterfly along with some Dazzling Details for some sparkle. The one thing I forgot to do before snapping the photo was to put some Soft Suede card stock on the binding. Sigh... some days I wonder about me. Now it's time to finish up before my guests start arriving. My Open House is this evening. I have a couple more things to mark off my list, then I can sit down and take a break before the fun begins.